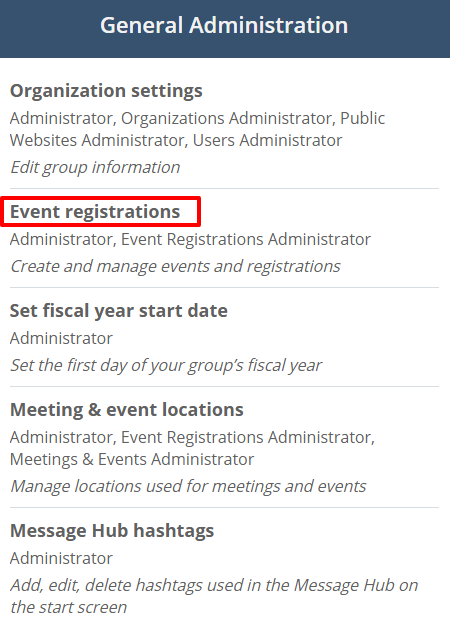 Easily create and manage event registrations so that members and non-members can register. 2. Under General Administration heading, locate Event registrations. 4. Fill out the necessary information. You can write the name of the event, short description, location, timezone, event dates, registration open and close date, cancellation policy text, registration form intro text and the event type. You can also create custom fields and set how it will appear on the registration page. 5. Click the Create button on the bottom of the page. 1. If Ticket mode is checked, no registration types are needed. It will only be used for selling tickets. 2. If Pay later with check is ticked, Complete and pay with check button will reflect on the registration page in the public website.